Slim, streamlined form and graceful flight characterize these sparrow-sized birds. Pointed wings; short bill with very wide gape; tiny feet. FOOD: Mostly flying insects. RANGE: Worldwide except for polar regions, some islands. 53A in. (15 cm). Adult: Male steely blue, tinged green, above; white below. Female slightly duller than male. Juvenile: Dusky gray-brown back and dusky smudge across breast. Tree Swallows have distinctly notched tail; glide in circles, ending glide with quick flaps and a short climb, voice: Rich chcet or chi-veet; a liquid twitter, weet, trit, weet, etc. 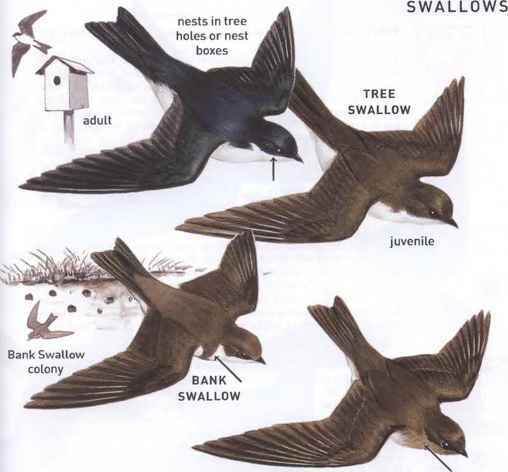 similar species: May be confused with Violet-green Swallow (white or light brown above eye, more obvious white patches on sides of rump), Northern Rough-winged Swallow (dingy throat, different flight style), or Bank Swallow (bolder dark breast-band than juvenile Tree, smaller overall, browner above). All species also have different calls, habitat: Open country near water, marshes, meadows, streams, lakes, wires. Fall premigratory flocks roost in reeds. Nests in holes in trees, birdhouses. 5 in. (12 cm). Our smallest swallow. Brown-backed with slightly darker wings and paler rump. Note distinct dark breast-band. White of throat curls up behind ear. Wingbeats rapid and shallow. voice: Dry, trilled chitter or rattle, brrt or trr-tri-tri. similar species: Northern Rough-winged Swallow and juvenile Tree Swallow. When perched in mixed-species flocks, Bank's smaller size stands out. habitat: Near water; fields, marshes, lakes. Nests colonially in dirt and sand banks. 5'A in. (12 cm). Adult: Brown-backed; does not show contrast above that Bank Swallow does; throat and upper breast dusky; no breast-band. Flight more languid; wings pulled back at end of stroke. Juvenile: Has cinnamon-rusty wing bars, voice: Call a low, liquid trrit, lower and less grating than Bank Swallow's, similar species: Bank Swallow and juvenile Tree Swallow. habitat: Near streams, lakes, rivers. Nests in banks, pipes, and crevices, but not colonially as Bank Swallow does. 5'A in. (13 cm). Note white patches that almost meet over base of tail. 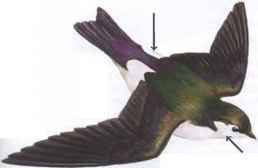 Male: Dark and shiny above; adults glossed with beautiful green on back and purple on rump and uppertail; clear white below. White of face partially encircles eye. Female and immature: Somewhat duller above, and white above eye tinged grayish or brownish, voice: A twitter; a thin ch-lip or chew-chit; rapid chit-chit-chit wheet, wheet. similar species: Separated from Tree Swallow by pale feathering above eye, greener back, white patches on sides of rump, slightly smaller size, and shorter wings. See also White-throated Swift. habitat: Widespread when foraging. Nests in holes in cliffs and in trees in open forests, foothill woods, mountains, canyons, towns. 8 in. (20 cm). The largest N. American swallow. Male: Uniformly blue-black above and below; no other swallow is dark-bellied. Female and juvenile: Light-bellied; throat and breast grayish, often with faint gray collar. Glides in circles, alternating quick flaps and glides; often spreads tail. voice: Throaty and rich tehew-wew, etc., or pew, pew. Song gurgling, ending in a succession of rich, low guttural notes. similar species: Tree and Violet-green swallows, much smaller than female Purple Martin, are cleaner white below. In flight, male martin might be confused with European Starling. habitat: Towns, farms, open or semiopen country, often near water. In East, nests exclusively in human-supplied martin houses. In West, uses cavities in trees (e.g., sycamores, ponderosa pines), posts, and, in s. AZ, saguaros; rarely martin houses. 5'/2 in. (14 cm). Similar to Cliff Swallow (rusty rump, square-cut tail), but face colors reversed: throat and cheeks buffy (not dark), forehead dark chestnut (not pale, although Cliff Swallows in Southwest have chestnut forehead). Buff color sets off dark mask and cap. voice: Clear, sweet wect or cheweet; a loud, accented chu, chu. similar species: Cliff Swallow; Cave has buffier throat and face, more deeply colored rump, different call, habitat: Open country. Cuplike nest placed in caves, culverts, and under bridges; nests colonially. 5V2 in. (14 cm). Note rusty or buffy rump. Overhead, appears square-tailed, with dark throat patch. Glides in a long ellipse, ending each glide with a roller coaster-like climb. voice: Zayrp; a low chur. Alarm call keer! Song consists of creaking notes and guttural gratings; harsher than Barn and Cave swallows' songs. similar species: Barn and Cave swallows. habitat: Open to semiopen land, farms, cliffs, lakes. Nests colonially on cliffs, barn sides, under eaves and bridges; rarely on trees. Builds mud jug, or gourdlike, nest. Barn and Cave swallows build cuplike open nest; and Barn Swallows often but not always nest inside the barn. 6}A in. (17 cm). 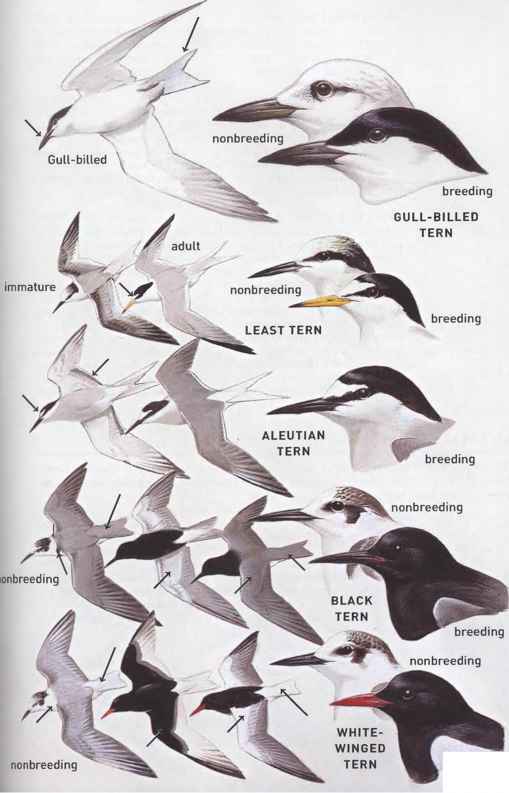 Our only swallow that is truly swallow-tailed; also the only one with white tail spots. Adult: Blue-black above; cinnamon-buff below, with darker throat. Immature: More whitish below. Flight direct, close to ground; wingtips pulled back at end of stroke; not much gliding. voice: Soft vif or kvik-kvik, vit-vit. Also szee-szah or szee. Anxiety call a harsh, irritated ee-tee or keet. Song a long, musical twitter interspersed with guttural notes. 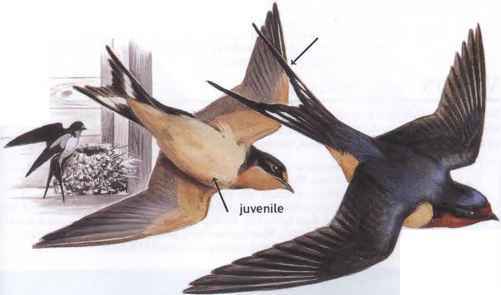 similar species: Most other N. American swallows have notched (not deeply forked) tail. 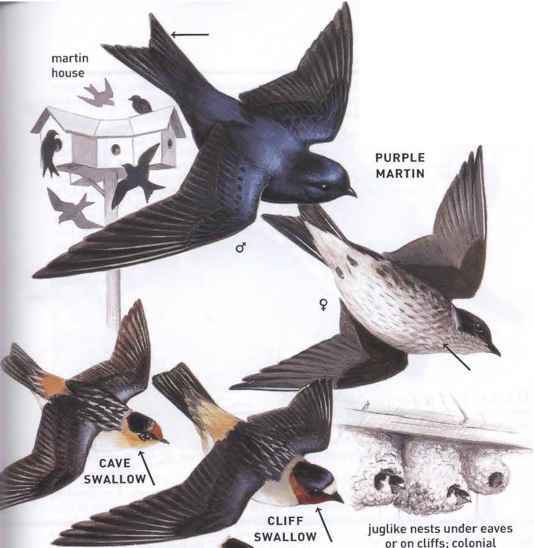 Cliff Swallow is colonial, building mud jugs under eaves or cliffs. See Cave Swallow. habitat: Open or semiopen land; farms, fields, marshes, lakes; often perches on wires; usually near habitation. Builds cuplike nest inside barns or under eaves, not in tight colonies like Cliff Swallow. 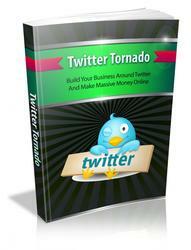 Who else wants to tap into one the fastest growing traffic sources online? Discover How To Tap Into To A 200 Million Strong, Highly Targeted Traffic Source And Rake In Tons Of Cold Hard Profits Easily. The Secrets Im About To Reveal Will Teach You How You Can Dominate A New Source Of Traffic With Ease, Even On A Shoestring Budget And Flood Your Business With Leads.